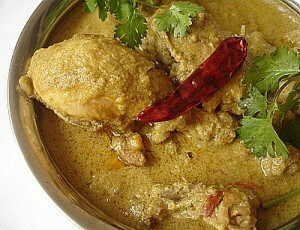 Chicken Korma With White Sauce recipe by Nazia at DesiRecipes.com. 1. Heat oil in a heavy based skillet; add onions and saut until golden brown. Remove onions with a slotted spoon and grind to a fine paste. 3. Add cream and cook on low heat, until chicken is cooked through, about 15 minutes. Add little water if gravy is thick. Remove from heat and sprinkle with coriander and serve hot with Nan. Bay Leaf "Tezz Patta" in Urdu - Also called Cassia Leaf, fresh or dried bay leaves are used in cooking for their distinctive flavor and fragrance.